When I saw this fun stamp from Sasayaki Glitter, I couldn't help but color him up. This one is called Barbie Mate. I have never colored a seahorse before so I had to look it up to see how their colors are. I started by using Copic markers to color the image. I then used distress ink to watercolor the background. Since I colored the background in after I finished the image, I didn't create a mask for it. I used watercolor brushes to paint the background with distress inks, then stamped the sentiment and popped the image onto the plaid paper using foam tape. 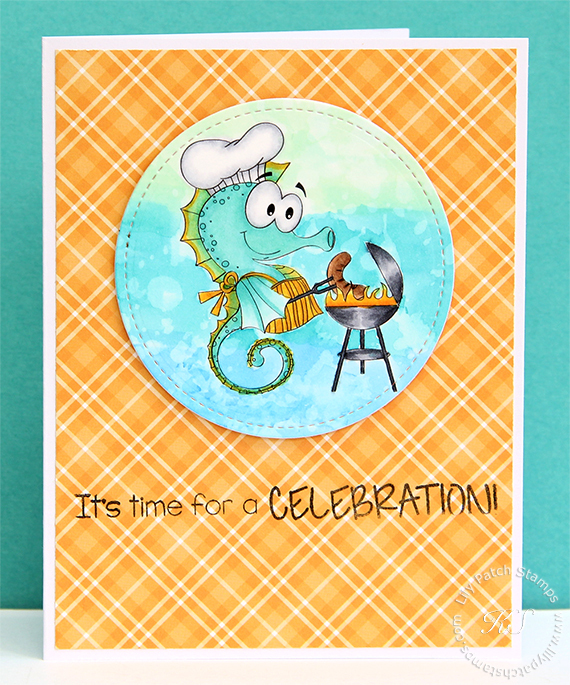 What a fun card...love your images, just too darn cute! Thank you so much for playing along with us at ATSM! Nice card, thanks for playing at Crafty Sentiments Designs. This instantly made me smile, such a fun card and love how you have coloured him.